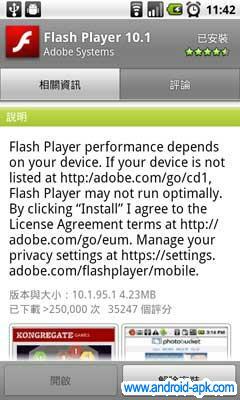 Flash Player 10.1推出了更新, 以修補一個早前發現的保安漏洞. 這個漏洞可能會導致Hang 機, 甚或讓駭客入侵. 大家快快上Market 更新 Flash Player 10.1! A critical vulnerability exists in Adobe Flash Player 10.1.82.76 and earlier versions for Windows, Macintosh, Linux, Solaris, and Adobe Flash Player 10.1.92.10 for Android. This vulnerability also affects Adobe Reader 9.3.4 and earlier versions for Windows, Macintosh and UNIX, and Adobe Acrobat 9.3.4 and earlier versions for Windows and Macintosh. This vulnerability (CVE-2010-2884) could cause a crash and potentially allow an attacker to take control of the affected system. There are reports that this vulnerability is being actively exploited in the wild against Adobe Flash Player on Windows. Adobe is not aware of any attacks exploiting this vulnerability against Adobe Reader or Acrobat to date.